1930’s British engineering at its very best. Put some fun back into your flying. This is Piper Cub flying at a fraction of the cost. Engine; Lycoming 0-235. 115hp. 810 hours. 515 hours since top overhaul. (Used regularly so hours will increase). Airframe 560 hours. New PERMIT issued by IAA 30th October 2016. Fuel capacity 21G uses approx. 23L / h.
Very low stall speed, approx. 35knots. It is easy to fly and land, excellent first tail dragger. No electrics, no radio (I use a hand held), no transponder, no flaps, no lights…………… very low maintenance. Battery powered intercom. Flown solo from the back seat, this opens up a whole new world of inexpensive flying. It has full dual controls. 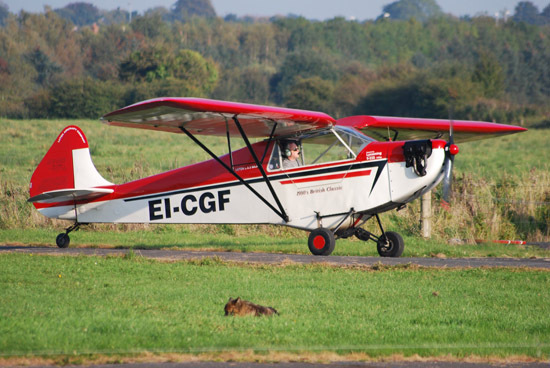 With no tail wheel experience I have operated this aircraft with great fun for almost 3 years and I have now moved on to an open cockpit bi-plane, also flown solo from the rear seat. Cruise along on a summers evening with the side door open …….. delightful. Contact; Brian at (353) 087-6701356. Located at EICN close to Shannon Airport.